The Third Sunday of Great Lent today maintains the most ancient liturgical practice of all the Sundays of Great Lent, dating back to the seventh century. However, before the seventh century, the Third Sunday of Great Lent was very similar to how we celebrate the First Sunday of the Triodion today. The Gospel reading before we began honoring the Veneration of the Cross was the Parable of the Publican and the Pharisee. This went along with the previous Sunday Gospel reading, which was dedicated to the Parable of the Prodigal Son, emphasizing repentance and humility, not only for the faithful, but also for the catechumens who were preparing for Holy Baptism on either Lazarus Saturday or Holy Saturday. Today only the Doxastikon of the Praises during Matins and many Idiomela remind us of the Publican and the Pharisee. In 614, the Persian king Chosroes II sacked Jerusalem and took, along with the spoils, the relics of the True Cross which were enclosed in a gold-plated box. However, they were recovered fourteen years later by Emperor Heraclius II (610-641) who defeated the Persians and in the spring of 629 personally carried them back to Jerusalem. The return of the True Cross to the Church of Jerusalem by the Emperor considerably enhanced the veneration of the Holy Cross. It was about this same time that, in Jerusalem, the week of the Third Sunday of Great Lent was also dedicated to the Veneration of the Holy Cross. It should also be noted that the Orthodox Church celebrates the Discovery of the Cross by Saint Helen on March 6th, having taken place on March 6, 326. This has become a forgotten feast in the Orthodox Church, though it still celebrates it. Seeing that March 6th usually falls around the time of the Third Sunday of Great Lent, it seems that this feast was transferred to the Third Sunday since the celebration of feasts and saints on weekdays of Great Lent is forbidden by canon law due to its mournful and solemn character, and they should be transferred to the nearest Saturday or Sunday when the celebration of the Divine Liturgy is allowed. Thus, when you take all these events into account, it becomes obvious why the Third Sunday of Great Lent is dedicated to the Holy Cross. St. Sophronios (+ 638), the holy Patriarch of Jerusalem, testified to this in a sermon delivered in the Church of the Holy Sepulchre. He gave the following reasons which inspired this mid-Lent devotion to the Holy Cross: 1. To encourage the faithful in their spiritual efforts during Lent; 2. To assure them of the remission of their sins; 3. To join their sufferings to the redeeming sufferings of Jesus Christ, that they also become the partakers of His glorious resurrection. St. Sophronios also instructs for the Cross to be displayed in the middle of Lent for the faithful to venerate it (cf. Migne, P.G., 87, 3309-3316). 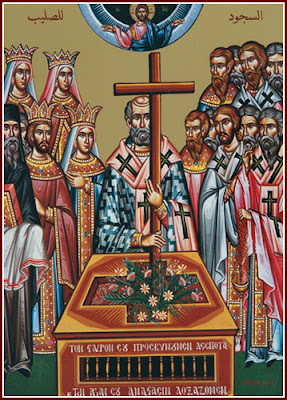 After the Seventh Ecumenical Synod, which convened in Nicaea in 787 A.D. and approved the veneration of icons and, particularly, the veneration of the crucifix, the exposition of the Holy Cross on the Third Sunday of Lent was introduced in Constantinople. It was liturgically enriched by the compositions of St. Theodore the Studite (+ 826) and his brother, Joseph the Studite (+ 833). The Book of Ceremonies, compiled by the order of the Emperor Constantine VII Porphyrogennetos, in the middle of the tenth century, describes the manner of the six-day exposition of the holy relics of the Cross for Mid-Lent Sunday which is referred to as the “Sunday of the Veneration of the Cross” (cf. Migne, P.G., 112, 1017-1020). However, in the ninth and tenth century Typikon for Hagia Sophia, on the Third Sunday of Lent, the Church of Hagia Sophia itself was celebrated, and this was until the thirteenth century, and the Cross was venerated there on the Wednesday of the Third Week of Lent. The Typikon of the tenth century also states that the Third Sunday of Lent was the last call for catechumens to be instructed for Baptism that year, since proper time was needed for their catechesis. In the twelfth or thirteenth century, the Veneration of the Cross became the focal point of Great Lent in Hagia Sophia, and this passed through to all the churches at this time. According to the Book of Ceremonies, the six-day-long celebrations started on the Third Sunday of Lent in the skeuophylakion of the imperial palace. Between the third and sixth ode of Matins, the “three glorious and life-giving crosses”, were removed from the treasury, embalmed by the protopapas, and taken to the Nea Ekklesia, to be venerated by all. After Matins was concluded, the crosses were taken to the gallery of the church, where the clergies of the Nea and the imperial palace jointly intoned the troparia of the Crucifixion. At this time, the emperor and his co-emperors were given the opportunity to venerate and kiss the honorable and life-giving relics. Then, the three crosses were separated from each other. Accompanied by the clergy of the Nea, a deacon carried one of them back down to the main level of the church to be displayed for further veneration. The second cross was taken over by the papias of the Great Palace, who, accompanied by the palace clergy, the protopapas of the Church of Saint Stephen, and the diaitarioi of the palace, carried it in festive procession through the Heliakon [of the Chrysotriklinos] and the Chrysotriklinos into the Lausiakos, where it was displayed for the veneration by members of the senate. The cross was then taken to the Church of the Protomartyr Stephen in the Daphne palace, where it remained over night. On the following day, the papias took the relic to Hagia Sophia, where it was displayed for veneration by the faithful during the rest of the week. The third cross never left the gallery of the Nea. After noon on Friday, when public venerations had ended at Hagia Sophia, the papias and the clergy of the Nea brought the respective crosses back into the palace. Finally, between the third and sixth ode of Matins on the Fourth Sunday of Lent, the protopapas and the skeuophylax returned all crosses to the skeuophylakion.